Just a short note today- it’s a busy time of year what with family and friends and holiday fun. 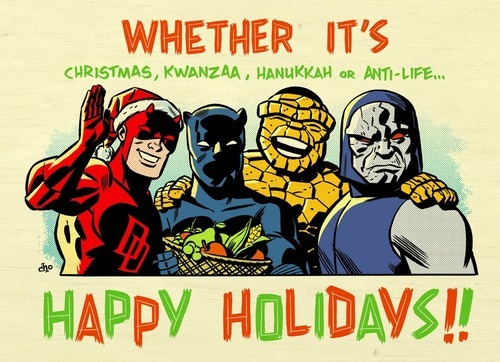 But we here at NerdLush wanted to be sure to wish all of you a very happy holidays- whatever you celebrate. I’ve returned to the hometown to spend Christmas with my family and will likely be here through the new year. I know most of, if not all, of the crew are doing similar… at least as much as possible. However and whoever you celebrate with… remember to be safe and responsible. Don’t drive intoxicated or through weather that isn’t safe. Stay warm and cozy. Well… I’ve got more cookies to bake… Santa will not be able to leave after he gets to my house- diabetic coma and all. So… all the presents will be mine! Mwahahaha!